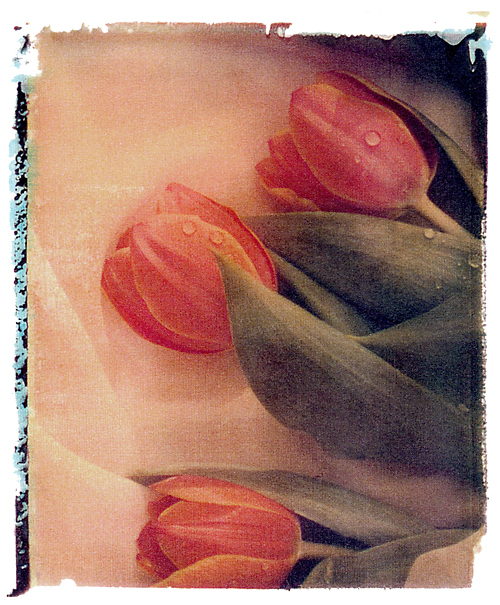 My favorite Polaroid transfer image.. I launched a “win free notecards” contest (but you had to submit a story as the entrance fee) in May of last year. I got a few interested folks who said they had a story to submit, but I didn’t get any bites. Nary a one. Do you have an idea how many of these notecards I still have in my storeroom? (I used them as a promo years ago and still use them for that purpose, as well as for gift-giving—-even used them as favors for our guests at our wedding in October!) Take pity and submit a story so I could send you some. Have a heart! If you’re interested, click here to read the contest rules & regulations. Shucks, I’ll take a page out of the Payless Shoes book (BOGO—Buy one, get one)) and make this a WOGTWO (Write one, get two) deal and throw in an extra dozen cards for the winner. I may get loopy and choose two or three winners. You just never know. Remember, if you don’t enter, you can’t win! On Lake Land ‘Or in Virginia…two sets of Canada Geese parents with 11 goslings between them. I think seven belonged to one family and four to the other parents—at least that’s the way this gaggle kept dividing when they paddled away from the dock. This group formed what is known as a crèche. According to Wikipedia: During the second year of their lives, Canada Geese find a mate. They are monogamous, and most couples stay together all of their lives. If one is killed, the other may find a new mate. The female lays 3–8 eggs and both parents protect the nest while the eggs incubate, but the female spends more time at the nest than the male. Known egg predators include Arctic Foxes, Northern Raccoons, Red Foxes, large gulls, Common Raven, American Crows and bears. During this incubation period, the adults lose their flight feathers, so they cannot fly until their eggs hatch after 25–28 days. Adult geese are often seen leading their goslings in a line, usually with one parent at the front, and the other at the back. While protecting their goslings, parents often violently chase away nearby creatures, from small blackbirds to humans that approach, after warning them by giving off a loud hissing sound (often with a side of their head turned to the intruder). Although parents are hostile to unfamiliar geese, they may form groups of a number of goslings and a few adults, called crèches. 1. Canada geese are herbivores; do not feed them with fish or cat food. 2. Feed whole wheat and cracked corn, not bread. Bread is not nutritious. 3. If feeding wild bird seed, remember that geese do not eat sunflower seeds. Therefore normal wild bird seed may be wasted on them. 5. Do not feed geese from your hand as it can be dangerous. Spread seed on the grass so geese can feed on the seed while foraging. Hmmmm…we tossed out tiny bits of bagel bread this afternoon—that’s the last time we’ll do that now that we know! And thank you, Ken Moore! After reading Ken Moore’s article about Spiderworts (see previous posting), I came across the identity of those tiny striped flowers from Karen’s garden. 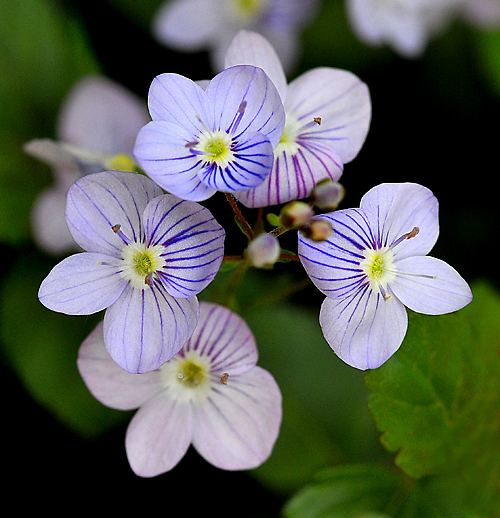 The plant is a Speedwell. Thank you, Mr. Moore! Karen and I both bought this plant at Merrifield Garden Center several years ago, but neither of us remember what it is! 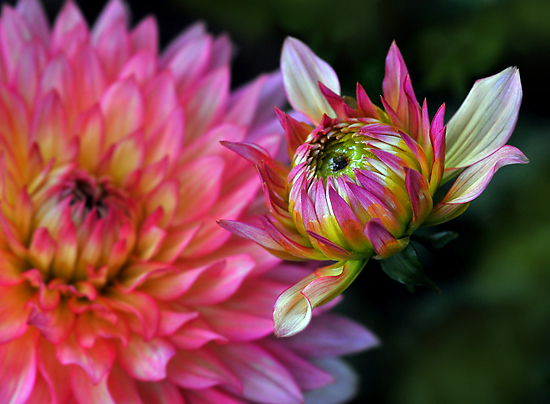 The petals are really unusual—all the petals have stripes on them, but they seem to graduate to one intensely colored petal where the stripes appear to thicken. The blooms are quite tiny—barely 1/2″ in diameter. Identity unknown—anyone? 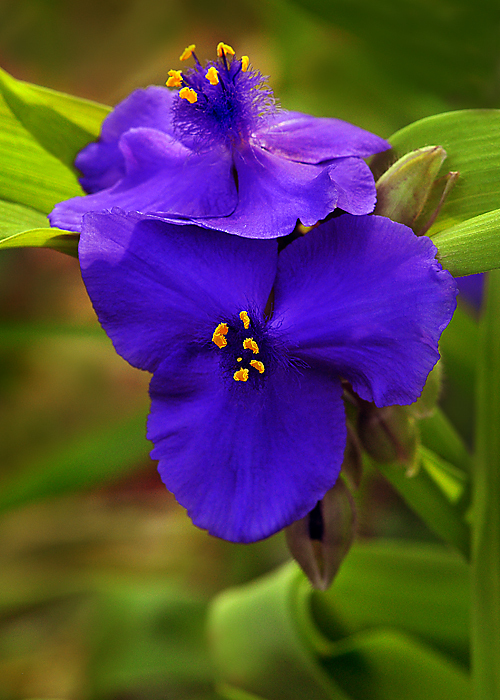 Spiderwort, photographed at Green Spring Gardens. 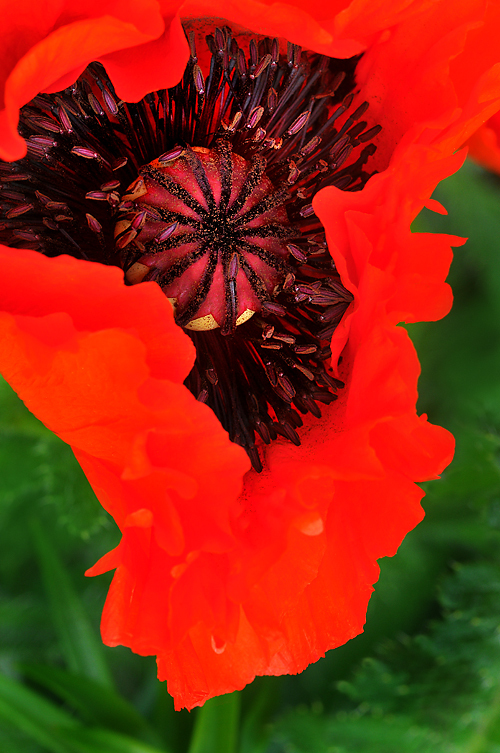 Learn more about this unusual flower in a great article here by Ken Moore, author of the column, Flora, published in The Carrboro Citizen, a weekly newspaper in Carrborro, North Carolina.